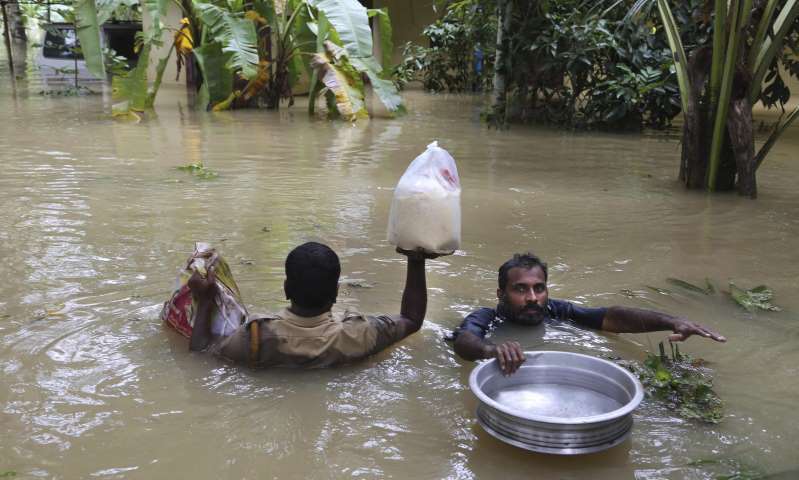 An Indian policeman, left, and a volunteer wade through chest-deep water to carry essential supplies for stranded people in Chengannur, Kerala. Water levels have started to fall in the south Indian state of Kerala and rain is predicted to ease in the coming days as rescue operations continue to free thousands still marooned by the worst flooding in a century. With the lull in heavy rain on Sunday, focus began to shift to providing for the more than 600,000 people sheltering in relief camps across the state with reported shortages of medicine, fuel and fresh water. About 13 deaths were recorded on Sunday by the evening, a sharp fall from 33 on Saturday and more than 100 in the preceding days when water levels were surging. More than 370 people have died since the monsoon season began in May, the majority in the past 11 days as the rain intensified. An official from India’s meteorological department told the Asian News Agency that rain was likely to ease over the next four to five days, giving a window for the military-led effort to rescue those still trapped or to air-drop food and water to stranded towns. [post_ads]The Indian armed forces have reported that 23,213 people have been rescued in recent days and 2,000 have been provided with medical aid. Kerala frequently floods during the monsoon season, but rainfall more than 250% greater than usual in the week to 15 August forced authorities to open the gates of dangerously full dams, sending torrents of water into the state’s river systems. The precise extent of the damage will remain unclear until waters subside, but Vijayan said at least 83,000km (51,570 miles) of roads would need to be repaired. About 20,000 homes and 40,000 hectares (98,800 acres) of crops are also said to have been destroyed. More than 4,000 relief camps have been established across Kerala and disaster management officials said they were now focused on preventing the outbreak of water-borne diseases.